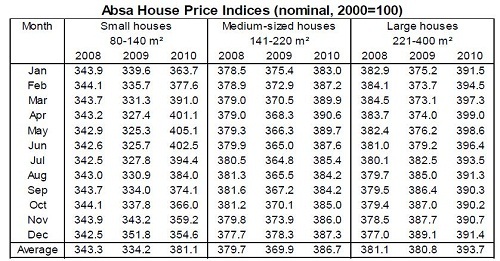 In the second half of 2010 price trends in the South African housing market differed substantially from the first six months of the year. 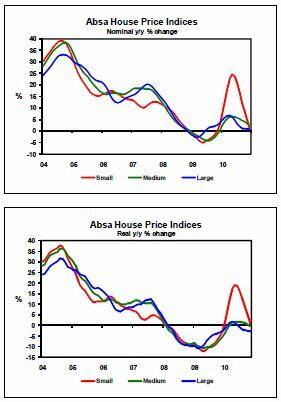 Nominal year-on-year (y/y) growth in the value of middle-segment homes for which Absa approved mortgage finance (see explanatory notes) was on a noticeable upward trend to average 11,1% y/y in the first half of 2010. However, price growth peaked around mid-year and slowed down significantly to an average of 2,6% y/y in the second half of the year. 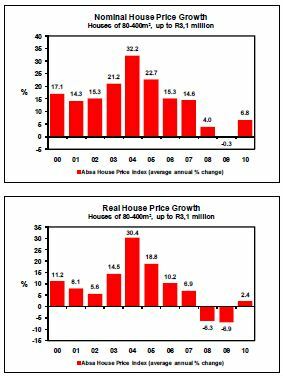 Nominal price growth of 6,8% was recorded for the full year (-0,3% in 2009), while in real terms, home values in the middle segment increased by an estimated 2,4% last year after declining by 6,9% in 2009. The slower pace of house price growth in the last six months of 2010 is related to the base effect of a recovery in house price growth in the second half of 2009, while economic conditions such as slowing economic growth, job losses, stagnant consumer confidence and fewer interest rate cuts than in 2009, also played a role during 2010. Although interest rates are at their lowest level in more than 30 years, a relatively high household debt-to-income ratio, currently at 78,5%, and the effect of the National Credit Act, impacting banks’ credit criteria, are limiting many consumers’ ability to take up credit and increase the level of debt. This situation is reflected by year-on-year growth in household credit extension, as well as growth in household mortgage finance, which both remained in single digits up to late 2010. The average value of small houses (80m²-141m²) increased by a nominal 14% in 2010 after rising by only 0,8% y/y in December, bringing the average price of a small house to about R706 300 by the end of last year. In real terms, i.e. after adjustment for the effect of consumer price inflation, price growth came to 1% y/y in November. In the segment of medium-sized houses (141m²-220m²) the average nominal price increase was 4,6% in 2010, with price growth of 2,4% y/y recorded in December. This brought the average price in this category of housing to around R967 600 in December. A real price decline of 0,3% y/y was registered in November last year. In respect of large houses (221m²-400m²) the average nominal price level was up by 3,4% in 2010, while marginal price growth of 0,6% y/y occurred in December, which brought the average price of a large house to around R1 425 600 by year-end. In real terms the price of a large house was down by 2,7% y/y in November. Although month-on-month price trends appear to be improving in some categories, year-on-year growth in nominal home values is set to start 2011 at a very low level. House price growth is projected to gradually improve during the course of the year on the back of interest rates forecast to remain low and real economic growth expected to pick up to almost 4% this year from an estimated 2,8% in 2010, which will benefit levels of employment and growth in household income. Against this background nominal house price growth of about 3% is forecast for 2011 (6,8% in 2010), whereas in real terms, house prices are expected to decline by around 1% in 2011 (up by an estimated 2,4% in 2010), based on projected nominal price growth and taking into account headline consumer price inflation forecast to average 4,1% y/y in 2011. The information in this publication is derived from sources which are regarded as accurate and reliable, is of a general nature only, does not constitute advice and may not be applicable to all circumstances. Detailed advice should be obtained in individual cases. No responsibility for any error, omission or loss sustained by any person acting or refraining from acting as a result of this publication is accepted by Absa Group Limited and/or the authors of the material.